Crooked Stave released nearly a dozen different beers in 2012 for their Cellar Reserve Members. 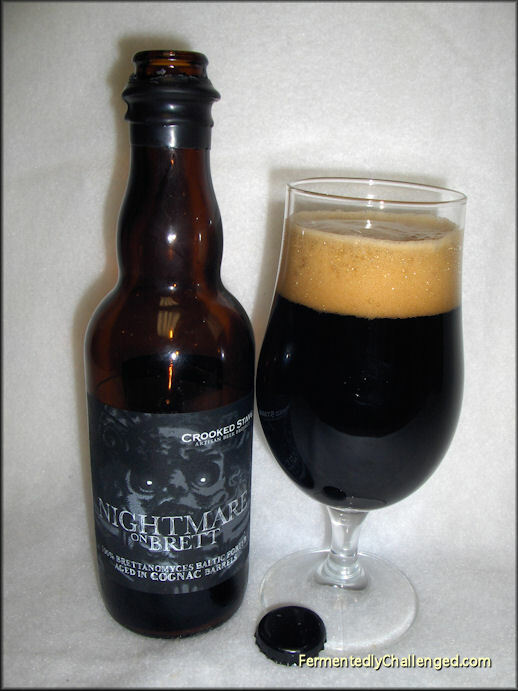 Once such beer that was released near the end of 2012 was Crooked Stave Nightmare on Brett - a 100% Brettanomyces Baltic Porter aged Cognac Barrels. According to the label, this beer spent a full 12 months aging in a single French oak Cognac barrel (#59). Nightmare on Brett is no light-weight either, this one weighed in at a hefty 9.666% ABV. Since the 666 was part of the measurement, the brewery gave it a "demon" designation. The brew came in a black wax dipped 375ml bottle. This is one of those beers that was only given out to Crooked Stave's Cellar Reserve Members and members got 2 bottle of this with their membership with an option to buy several more if desired. This is just one of 5 different versions of Nightmare on Brett. Now that the history lesson is over, let's crack open this dark sour beer. Appearance: Nightmare on Brett Cognac Barrel poured a very dark brown with a full 2-finger tall tannish brown head. A thin line of head remained well after the pour was done. There wasn't much lacing on this beer at all. The lacing slid off very quickly on this brew. Even though this beer was originally released back in early December 2012, this bottle opened up with a nice hiss. The beer was too dark to notice if there was any sediment in this 375ml bottle. Aroma: If this brew was supposed to have any roasted aroma, then it was covered up by the aroma of Brettanomyces, leather and a slight oakish tone. I could also pick up a hit of alcohol in the nose in this big beer. Some people pick up cocoa in the nose, but I could not, rather I got some dark fruit, wine, funk and light roast. The cognac was perceptible as well. Later in the sampling after this warmed, I could pick up a bit more darker roast, but not much. Taste: The first taste of this beer was quite tart, semi-sweet and slightly acidic. Nightmare on Brett Cognac Barrel did not remind me of a porter at all, but rather a big sour ale. It tasted of lighter malts than what I was getting. I believe the extra months in the bottle really let the Brettanomyces and tartness really dominate this brew. This beer felt "sharp" on my tongue with a biting tang that lasted the entire sip start to finish. The brettanomyces really dominated the entire sampling, almost a bit too much, but for a sour fan like me, I tended to ignore that and savored the sour anyway. I could also pick up the French oak flavor and cognac in this beer. It's quite different than whiskey, bourbon or rum. Perhaps the cognac added a higher alcohol taste to this, but at 9.666% ABV this beer already had an "evil" all it's own, but in a good way. Overall: Of all the Crooked Stave beers I've tried to date, this one had the most acidic sour bite I've seen. It was almost too strong for this style. I was hoping to get a lot more roast out of this sour porter, but the Brett and cognac barrel took center stage and never let up. Despite that, I quickly adjusted to this beer. I enjoyed it as a sour ale tremendously, but as a Baltic Porter it was far from expected. The brett really did a number on this beer. If someone would have simply told me this was a sour ale I would have gobbled it up and loved it. Sour fans will still love this brew regardless of the style it was trying to match. Crooked Stave has a few different versions of Nightmare on Brett and I'll have to compare this one with the bourbon, rye, grand cru and brandy versions. As for this version, I'd suggest drinking this beer with food - perhaps a steak. This would even work as an after dinner beer, perhaps with a sweet dessert to counter the tartness. Update 05/19/2014: I kept one bottle of this in my cellar for almost another year. The tartness is still there, but had died down just slightly. This brew still had quite the sour kick to it. I believe this brew was a bit more palatable with the addition of another year. Still quite good and well worth the wait. Disclosure: I paid for this bottle as part of the 2012 Crooked Stave Cellar Reserve Membership. - Crooked Stave Surette Reserva Chardonnay Barrel 2012 review.